Being the new kid in class can be a hard, and difficult adjustment even if you are a rat. 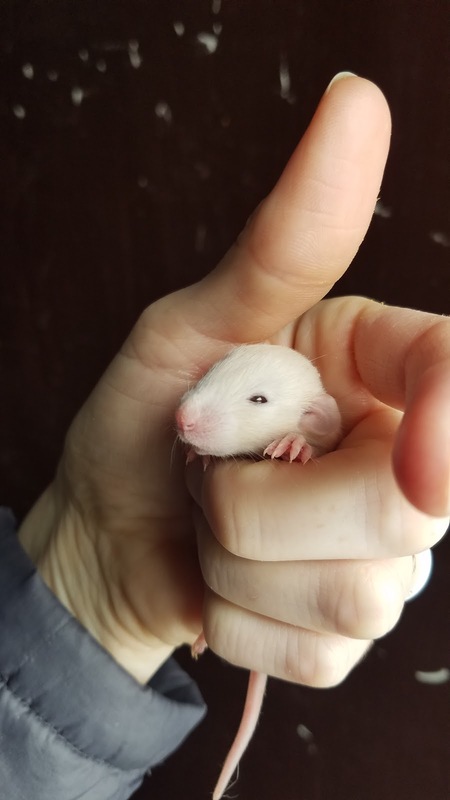 We got our rats March 27th. The date is burned into my 3rd graders' brains because to an 8 or 9 year old it was very a long journey from our decision to get rats as a classroom pet, to when they finally joined our class. First, the students had to write persuasive letters convincing me to get a classroom pet. Then, we (I) had to do the research. Next, we needed a large cage, accessories, food, bedding, etc. for the rats. I didn't want to get any classroom pets if I couldn't provide a safe, healthy, and enriching environment for them. Since my classroom budget was spent, I gave Donor's Choose a shot. (You can check out what my project looked like at this link). Less than a week later, we had funding to get rats. Who knew so many people loved rats, and wanted to teach others about them? Now our only problem was where to get the rats? I had done my research and knew that I wanted to buy my rats from a breeder, or adopt them from the local Humane Society. However there were no reputable breeders selling at the time, and no rescue rats to adopt. 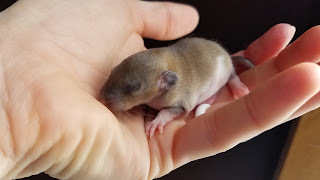 Luckily for me, my rat expert, Jessi Castaneda, from Animal Wonders, was teaching about animals in my classroom and had just had three litters of rat kits. She was going to give us two girls! Yeah! I was so excited, and so was my class until...they found out that we had to wait for 6 weeks to get our girls. Why? They couldn't understand why we couldn't just have the babies right then and there. It was a great teachable moment to remind my students that rats were mammals and needed to drink milk from their mother until they were old enough to move onto solid food. Plus, baby rats need time to learn to be a rat from their mother. Soon we had some photos of potential babies. Jessi was an amazing breeder to get rats from. She suggested that the criteria for our potential girls would be that they were healthy, plump, and that their mom's were good, nurturing, mother rats. Good mother rats have baby rats that are well adjusted and calm. Jessi handled the potential babies every day. This is an important thing to ask any breeder about your rats. Were they handled, and are they comfortable being held? The look of the rats didn't really matter to me, I just wanted them to be gentle and have a good-nature around my students. However, Jessi pointed out, that since we were trying to readjust people's attitudes about rats that choosing cute rats probablywouldn't hurt. We had a few choices on what our rats would look like. Jesse had dumbo rats, top eared rats, rex rats, and hairless rats. Dumbo rats have ears that are lower, rounder, and larger on the sides of their heads. Some people claim that dumbo rats have a sweeter disposition than top eared rats because they are bred purely to be people's pets. 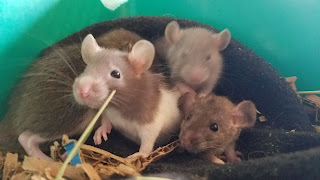 Top eared rats, on the other hand, may have been bred to become feeders for snakes, and may not have received the handling or attention that a dumbo rat received. Breeders may have also given a little more thought into the parents of a dumbo rat. 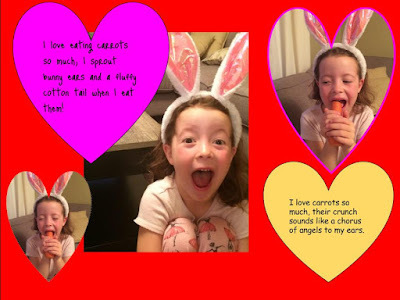 The parents are more likely to have been chosen because of their sweet and gentle nature. Ear types, by the way, are purely aesthetic. They do not benefit or harm the rats. A litter of rats may have both top eared babies and dumbo eared babies. In fact, my rats, Pip and Squeak, are sisters. Pip is a dumbo rat and Squeak is a top eared rat. I also have to add that in my experience, which isn't vast, there isn't a difference in their disposition. Squeak (my top eared rat) is just as sweet and as cuddly as Pip (my dumbo rat). Top eared rats have ears that stand up on the tops of their heads.This is the dominant type of ear that wild rats are born with. Rex rats have curly fur and whiskers. 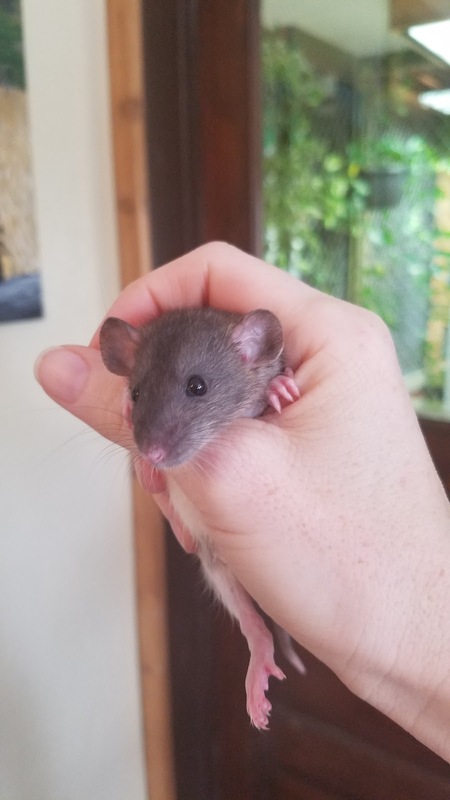 Rex rats are unique and softer than standard coated rats. Their coats may change as they grow older, and may become a bit patchy in places. Female Rex rats may also because less curly as they age, but their whiskers will always be curly. Jessi also had hairless rats, but she didn't think that my students, or their parents especially, were quite ready for a hairless rat yet. Jessi showing us how to hold our rats. language, and how to keep them happy and healthy. She demonstrated to the students how to let the rats treadmill between your hands if they are feeling active when you are holding them, and how to avoid grabbing them from over the top of their bodies. To a rat, a large hand reaching in looks like a predator's claw descending. It is much better, and less stressful, for a rat to be scooped up from underneath his/her body. It is also very, very important to never pick a rat up by her tail. You can cause serious damage to a rat's spine if you try and pick them up in this manner. After the presentation we had to vote on which rats we wanted. 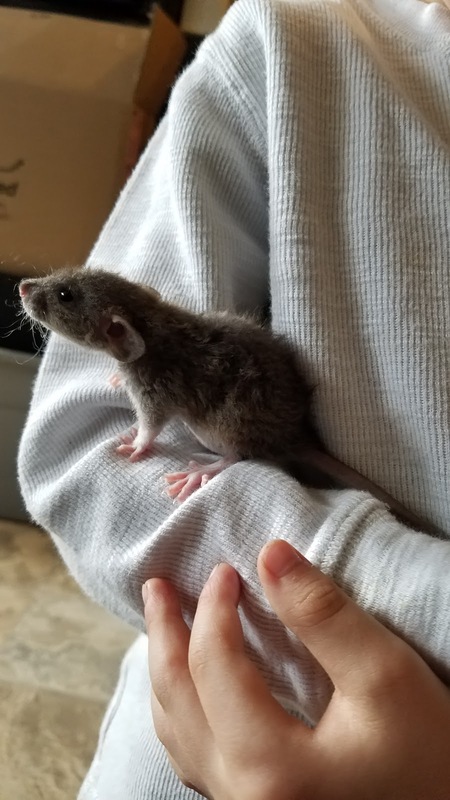 We had a choice on four little girls: a dumbo eared, agouti rat with a standard coat, a top eared, gray rat with a standard coat, a top eared hooded rat, and a dumbo eared, agouti rat with a rex coat. Of course the students wanted all four, but our rat cage just wasn't big enough for more than two rats. In the end, the students picked Pip, a dumbo eared, agouti colored rat, and her sister, Squeak, a top eared, hooded rat. A hooded rat has a solid color on its head, and a stripe down its back.Squeak has a gray hood and a rather spotty stripe down her back. The first two days we had Pip and Squeak we didn't bother them in their cage. We just let them get used to their new environment, the smells, and the sounds of a 3rd grade classroom. I was the only one in the room that handled the rats in the very beginning. I really didn't want Pip or Squeak to think of a hand in their cage as a bad thing, so I tried to persuade them to come to me with treats. You can persuade rats to do lots of things with treats. Pip and Squeak love baby rice puffs, especially the sweet potato flavored. After lots of treats, Pip and Squeak were running to the cage door whenever I entered the room, and to my hands to grab a tasty treat. When the students were out of the classroom, I would let the rats sit in my lap while I typed on my computer, or snuggle up in the hood of a sweatshirt I kept in class just for this purpose. I wanted them to get used to my smell, and also see that I was a person they could trust. You can actually get quite a good deal done with rats snuggled up in the hood of your sweatshirt. After the first few days, I let two students at a time stay in during recess and play with the rats. The students would spend time letting the rats smell them, and climb on them when they felt like it. We also set up some enrichment environments for Pip and Squeak to explore. Soon Pip and Squeak became used to just about anyone handling them. Now they love to sit on student's shoulders, and hide behind their hair, or burrow into a hood or sweatshrit pocket. I was really nervous about introducing the rats to my classroom. I worried that the rats wouldn't bond with us. I worried that a student would get bit or hurt by the rats. I worried that maybe a classroom wasn't a good environment for rats to live in. However, due to research, a great, educated breeder, and lots of patience and effort from my students, I think Pip and Squeak have found an enriching and loving home. Here is a wonderful video put together by Animal Wonders on rats. If you enjoy learning about animals and their care, then please subscribe to their You Tube Channel.